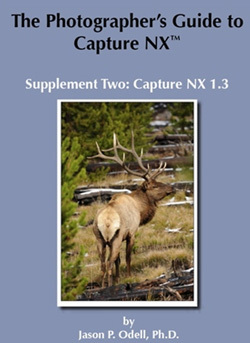 A brand new, 57-page addition to The Photographer's Guide to Capture NX is now available from Luminescence of Nature Press. The new addition to the popular eBook by Dr. Jason P. Odell (who also co-hosts the popular Nikonians Image Doctors podcasts) completely covers all the new features in Nikon Capture NX 1.3, including Picture Control and Active D-Lighting. The Photographer's Guide to Capture NX: Supplement Two is to date the only resource manual to describe in detail Nikon's newest version of their Capture NX software. The supplement is a free update to all registered users of the original "Guide." The Photographer's Guide to Capture NX, written by Nikonian Jason P. Odell, is the acclaimed user manual for anyone wishing to process Nikon RAW files with Capture NX. Since 2006, the "Guide" has helped thousands of Nikon users quickly and easily master the art of RAW processing, and has received rave reviews from the photographic community.